We all remember a time when tying our shoe laces wasn’t the easiest task in the book. A time when you reflect back on pictures and see how things were a lot more simple. 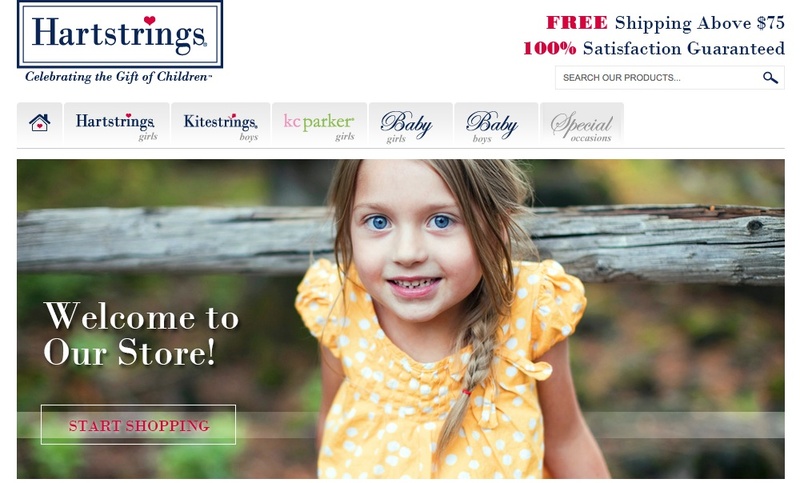 Hartstrings followed this lead by simplifying their online presence, pairing up with the experts at OC Designs Online! Now they bring an ease to celebrating the gift of children with this custom, sleek, and easy-to-navigate shop designed to house a quality children’s clothing line. On the welcome pane shoppers can find an adorable little girl smiling in a stylish, yet comfortable, yellow polka dot ensemble. Within the welcome pane of this eBay shop design, an easily accessible tab titled “Start Shopping” enables customers to start browsing pages of outfits geared toward today’s youth. With this format one can find multiple tabs bordering the top of the welcome pane to make searching for the perfect outfit a cinch. Customers can click a tab in this eBay template for girl’s clothing, boy’s clothing, baby clothing for both genders and outfits for special occasions. Having these options at the top of the page can bring customers directly to what they’re looking for in their child’s stylish yet affordable wardrobe. The midsection of this custom eBay store design introduces online shoppers to both new arrival and sale items on Hartstrings. Each tab is graced with a picture of a toddler sporting products from the store all-the-while pointing customers in the direction right for them. This four tab section can simplify searching for the price conscious and savvy shopper, with affordable deals and new steals are only a click away. Lastly, at the footer of the page online shoppers can find an area dedicated to “Featured Products”. This section guides customers to popular items within the store and products with a heavy amount a views. Four items are displayed horizontally along with the current price and option to “Buy Now” which takes the customer directly to the eBay checkout page. Here, shoppers can select a size, color and quantity before inputting their payment information. It’s as simple as that! Partner with OC Designs Online for a one-of-a-kind eBay shop design that meets your needs as well as the needs of your shoppers. Take some time to browse our portfolio of dazzling store designs, and then request a free quote.